It’s easy to snuff-out… murder… deep-six your response. Just use one or more of the following four, “straight-to-the-grave” ad-response killers. Hey, it’s one thing to not know and commit these errors, and quite another to do so despite reading this article. 1. Write Horrid Headlines—People skim ads until something stops them. Over 83% of people read ONLY the headlines. If your headline features only your business name or a cutesy slogan, you’ll likely miss grabbing the attention of someone who actually wants what you sell! Solution? Always put your biggest benefit/offer in your headlines. 2. Generate Generics—Don’t just sell pizza… sell YOUR pizza. Don’t sell auto repair… sell YOUR auto repair. Don’t sell everyone’s web design service… sell YOURS! Your ads should sell YOU… how YOU are better…why they should buy from YOU. Want more response? Then stop wasting money advertising products and services in general! If your competitor can use your ad without changing anything except the company name and contact information, you’ve written a money-wasting, generic ad that needs to be revised… fast! 3. Toss the Testimonials—People don’t believe testimonials, right? WRONG! They’re one of the most influential parts of any advertising. Get feedback from customers and feature it in ads, flyers, brochures, sales letters, and your web site. Psychologists call it “Social Proof”—people want to know that others have successfully gone first. So? Give it to them! 4. Go Picture-less—According to a study of 2,000 consumers, ads consisting of 50% visuals (photos, illustrations, graphics) were seen and recalled 30% more often than ads with no visuals. So feature some kind of picture in every ad. Photos are best… and action shots are the most effective when they demonstrate the product in use. Pretty darned simple, right? Now crack open your local newspaper or magazine. Scan a few promotional emails and websites. You’ll see these promotional tombstones everywhere you look. But why? This is basic, foundational stuff, isn’t it? The winged skull in this photo isn’t a fun Halloween decoration. 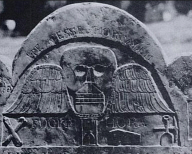 It’s the exact death’s head symbol common to many colonial gravestones. It’s often accompanied with an image of a clock and the words, “Fugit Hora“–the hour flies. It not only flies for each of us… but for our businesses as well. It’s time to get serious about your advertising. Not just regard it as a necessary evil or something that “just needs to be done.” It’s time to consider it the lifeblood of your business. It’s as important as the food on your table and the roof over your head. Your children’s education and medical care. No doubt you know your product or service inside and out. Now’s the time–if you haven’t yet done so–to learn what makes advertising effective. To learn the many common mistakes to avoid. To at least learn enough to effectively direct others to create effective advertising for you. Kick over these 4 common “stones” and next time we’ll knock a few more down. “CA$HVERTISING”… now in its 3rd printing from Career Press.